The last structure that Arup himself designed was the award-winning reinforced concrete Kingsgate footbridge in Durham, completed in 1963, almost mid-way through the Sydney Opera House saga. It crosses the River Wear, connecting the older colleges and new buildings of Durham University, and linking the Elvet area of Durham with the city's cathedral peninsula. Arup considered this bridge his finest work. He planned every detail, including the unusual way it was constructed, with calculations input from Yuzo Mikami and John Martin. A less dramatic example of Arup's marrying of engineering and architecture than the opera house, the bridge nonetheless stands as a symbol of his vision. The banks of the river are 17m high, the span 106.7m long. 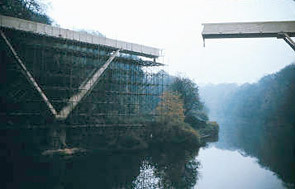 The need for scaffolding on the river was eliminated by the casting of the bridge in two halves, one for each bank. They were then swivelled 90 degrees to meet in the middle. The two halves pivoted on revolving cones, their meeting point marked by an understated bronze expansion joint. Concrete Quarterly described the result as "a thin, taut, white band stretching horizontally across the valley, resting on a pair of slender tapered fingers in a V-shape rising from each side of the river". With Kingsgate, Arup showed that a bridge is a good opportunity to close the gap between function and aesthetic, builder and artist. 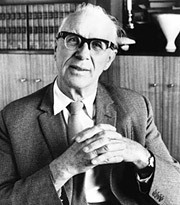 Arup's approach to the development of the Kingsgate design has been compared to how he conceived of his carefully wrought chess sets. He says it all in a paper published by the Arup Chess Company Ltd, "Designing a chess set is not so very different from designing any other object ... the first thing to ask is: Why are we making this thing, what is it for? ... [and] it must give pleasure by its aptness for the purpose, its beauty, its 'feel' ". In the years after the completion of the footbridge Arup started to withdraw from everyday work at the office. On reaching the company's retirement age he was awarded the honorary 'permanent' age of 64, and continued as the firm's public face. Of the many awards and tributes he received personally, notable are the Institution of Structural Engineers' Maitland Medal (1966) and Gold Medal (1973), the RIBA Gold Medal for Architecture (1966) and election as an Honorary Royal Academician (1986). A balance between structure, purpose and aesthetic is what Arup genuinely intended to achieve, and it is for this that he is remembered, not only by the company he founded, but also by friends, peers and family. A producer of awe-inspiring structures and an entertainer through doodles, doggerel and a refined Learesque (Edward, not King) sense of humour, Arup died in 1988 at the age of 93 having fully embraced the time in which he lived. Kingsgate footbridge over the River Wear in Durham. 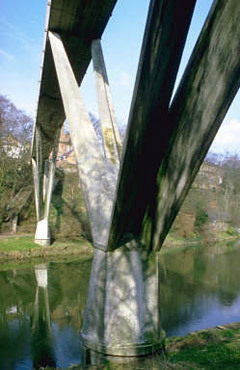 Kingsgate footbridge in Durham, completed in 1963. The bridge was constructed in two halves that were swivelled 90 degrees to meet in the middle. 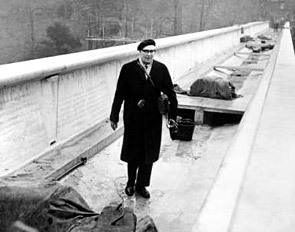 Ove Arup on Kingsgate footbridge.